Last weekend we all headed to the beautiful grounds of the Compton Verney Estate, just outside Kineton in Warwickshire for the first of our 375th Anniversary events, which you’ll see more and more of over the coming years. 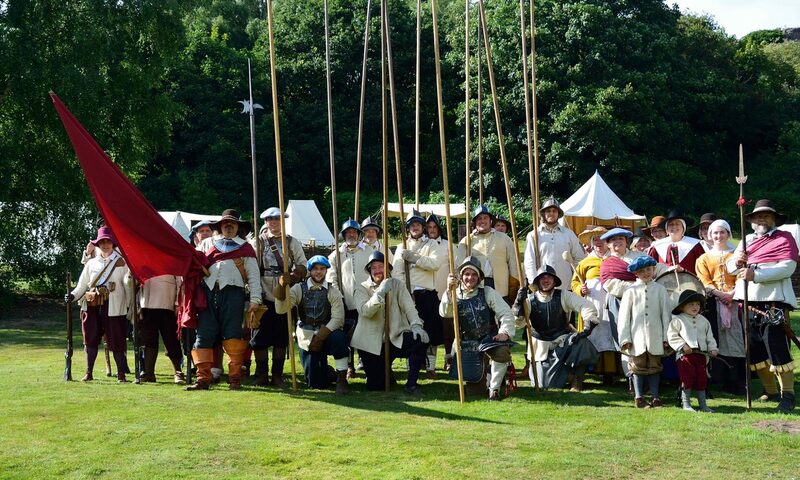 This weekend it was to re-enact the Battle of Edgehill which happened on the 23rd October 1642. August Bank Holiday has rolled around for this year and once again it was our biggest event of the year. This year we were at the beautiful Scampston Hall in North Yorkshire and we had a wonderful weekend with a particularly memorable (or in some cases a little hazy!) cocktail party! After the success of our event at Kenilworth Castle in May, and to repay the favour that our friends in Lisles regiment had done by coming to help out again and play our enemy once more, it was time for Newcastle’s to come and do their bit at Lisle’s own event at Helmsley Castle in North Yorkshire and what an excellent weekend it was! Another weekend and another Sealed Knot Re-enactment. This time at Tattershall Castle, a picturesque 15th Century moated castle with an imposing red bricked keep known as the Great Tower. Newark, Nottinghamshire: 23rd & 24th July 2017. This year we had the pleasure of going back to Newark, a muster we also did back in 2015. Once again, it was hot hot hot and we enjoyed a weekend in the sunshine. Late MayBank Holiday events are always a major affair for the society and having only seen each other 4 weeks previously at our event at Kenilworth, it was lovely to see each other again so soon. The Wiltshire location was beautiful and the battle took place in front of the house and we had to cross the estate’s private air strip to get from our campsite to the field! Our next event is very nearly here and it’s the first Major Muster of the season! We’re all getting very excited and ready to take to the field and fight hard once again on the Sunday and Monday of this upcoming Bank Holiday Weekend. This weekend, you’ll find us at the beautiful Charlton Park estate, just near Malmesbury in Wiltshire. The ancestral home of the Earl of Suffolk and Berkshire, this beautiful house was built out of the Abbey of Malmesbury when it was sold off in 1539 at the Dissolution of the Monasteries. We often think of the breakdown of gender stereotypes as being a modern concept, something very 21st century as the world becomes, little by little, more accepting of differences to gender. There’s still a long way to go before the prejudices are truly a thing of the past but is the breakdown of these prejudices really a modern thing? When studying a small girl’s waistcote and looking at just how much it resembled the restrictive nature of the adult equivalent, member of the regiment Beth Parker decided to look into the life of the little girl who this waistcote belonged to and found a very interesting character indeed. Last weekend, the regiment headed out for the first of two events we are taking part in at English Heritage properties this year. As the hosts, we had a lot to do but it was a great weekend and we had lots of fun. With the help of our friends in Lisles regiment, De Gommes reigment and some people from the Kings Guard and Houghtons regiments, we had a great weekend enjoying some fantastic public engagment and some more light-hearted battling at the beautiful Kenilworth Castle and Elizabethan Gardens in Warwickshire.